This DIY Detoxifying Body Scrub is a great way to help your body detox naturally. Learn How to Make a Detoxifying Body Scrub as well as the benefits. Detoxifying my body has been a major focus of mine this year. This started when I read that when your liver is congested, it can stand in the way of weight loss. There are many different things that I’ve done, which I will share below. But one of the most recent additions to my detox routine is this DIY Detoxifying Body Scrub. This Detox Shower Scrub is packed with essential oils that assist the body with detoxifying. I was a little scared of smell. Because…Oregano. But it isn’t bad at all. I probably wouldn’t use it before a date with hubby, but I honestly haven’t noticed the smell lingering on my skin. That said you can always leave the oregano off. Bentonite clay is made of aged volcanic ash. It is a very powerful clay that can absorb and remove toxins, heavy metals, and chemicals. Experts recommend a tablespoon of liquid bentonite in a cup of water for detox. Broccoli sprouts provide your body with glucoraphanin, which creates sulforaphane in the body. A study reported by Time Magazine reported that this helps the body detoxify from environmental pollutants. Try adding a tablespoon of ground flax seeds to your diet daily. It can help to improve your elimination of toxins. Add one cup of baking soda and one cup of Epsom salts to your bath. 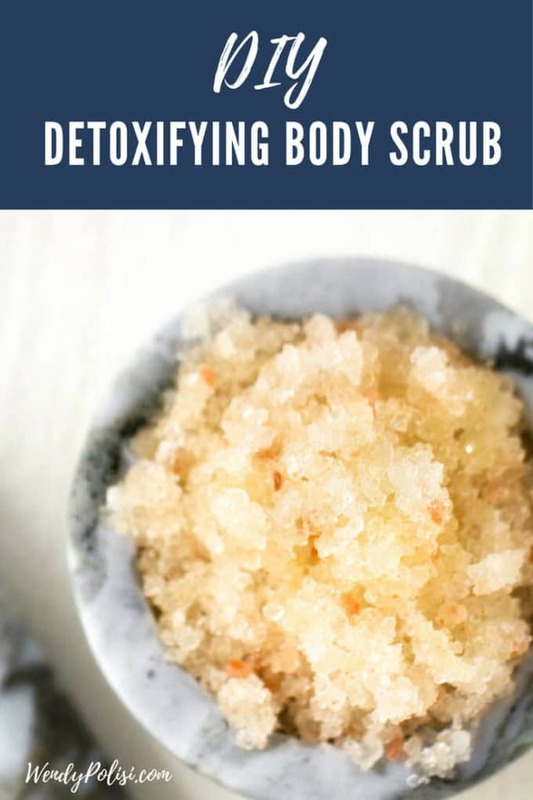 You can also add in detoxifying essential oils, like the ones used in this DIY Detoxifying Body Scrub. When adding oils to your bath, it is best to dilute them in a tablespoon of carrier oil first. Try to break a sweat every day. Sweating is a way that the body rids itself of toxins. If you can’t exercise, try using a sauna. This is one of the most powerful detox supplements around. I take it daily. Chlorella is a rich source of vitamin K. It has been used to detoxify heavy metals such a mercury. Avocado, artichoke, beets, garlic, green tea, lemon, and turmeric all support detoxification. Combine Epsom salts, sea salt and carrier oil in a glass bowl. Add essential oils and stir well to combine. Transfer to an oil-safe container. I recommend dry skin brushing prior to getting in the shower. With a dry brush, gently stroke the skin, moving in the direction of your heart. To use, massage in a circular motion and allow to sit on the skin for 10 minutes.